The club will be closed on Easter Sunday to allow our employees to spend the day with family. For details on our planned dinners and events, visit the Events page! SPECIAL THANKS: We want to thank Pacific Oil Resources/Van Buren Transfer Station Services for donating four comfort height toilets to our club. They will be a big help to our members with mobility issues. Your generosity is greatly appreciated. CLOSED EASTER SUNDAY: The club will be closed on Easter Sunday to allow our employees to spend the day with family. AERIE DUES NOTICE: Aerie member annual dues are due by May 31, 2019. Dues are $40. Membership cards will be behind the bar to save postage. Any cards not picked up by May 13th will be mailed out. AUXILIARY DUES NOTICE: Auxiliary member annual dues are due by May 31, 2019. Dues are $32 per year. The May karaoke dates and hosts have been added to the Events page. The next Friday night dinner is a Lasagna Charity Dinner on April 26, 2019. Details are on the Events page. The R.E.A.C. 's April Outing Blog post has been added. Visit the Blog to read about the awesome afternoon and to view the photo slideshow. Enjoy! The Kids' Easter Party Blog post has been added. Visit the Blog to read about the awesome afternoon and to view the photo slideshow. Enjoy! The Eagle Riders Chicken Strips Dinner has been added to the Events page. Life Line Screening is coming to our club on June 18, 2019. Details have been added to the Events page. Pre-registration is required. The Lasagna Charity Dinner has been added to the Events page. Hop over there to read all the details. We hope you can join us to support this great event. All proceeds will go to the Golden Eagle Fund. The April 2019 Michigan State Aerie Newsletter has been added to the website. You can find it at the top of this page and also on the Member News page. Click on it to open it in a new window. You can then choose to read it online, download it to your computer and/or print it out. R.E.A.C. 's April Outing has been added to the Events page. Join us for our Tiger Home Game Specials. Days and details are posted on the Events page. The first date is April 18th. The last day to sign your children up for the Kids' Easter Party is April 10th. Details about the party are on the Events page. Join us on Thursday, April 4, 2019, to watch the Tigers Opening Home Game and enjoy these food specials all day: Nachos & Cheese for $2.00 and Hot Dogs for $.50. 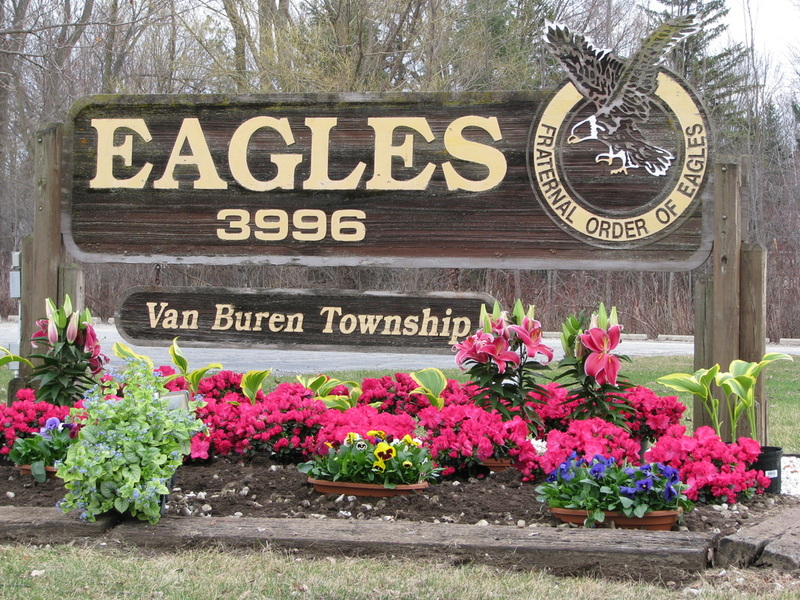 The April 2019 Van Buren Eagles Newsletter has been added. You can find it at the top of this page and also on the Member News page. Click on it to open it in a new window. From there, you can choose to read it, download it, and /or print it out. For April, 2019, the Aerie is collecting CANNED VEGGIES. The St. Patrick's Day celebration Blog post has been added. Visit the Blog to read about the awesome evening and to view the photo slideshow. Enjoy! The Kids' Easter Party has been added to the Events page. We have a new special! Every Thursday is Thirsty Thursday. Join us and get $.25 off all mixed drinks! You can put your donations in the collection box in the social room. Thank you! Special thanks to Jim Wagner for collecting and delivering our donations. We are proud of our own Debbie Gagneau! 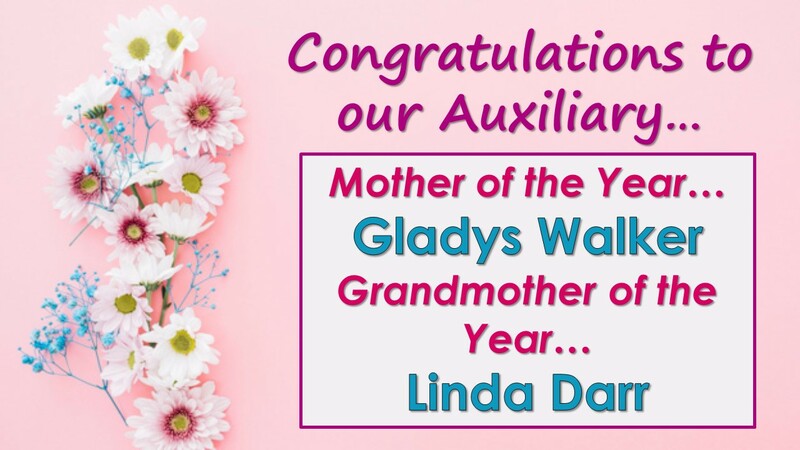 She is serving as Outside Guard for our State Auxiliary!